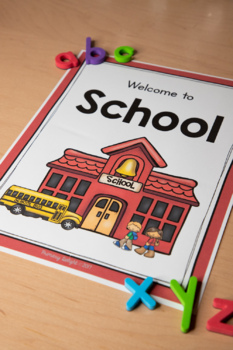 Create a pretend school in your dramatic play center and let your preschoolers or kindergarteners have fun "playing school." The materials in this kit will allow your students to apply reading, writing and math skills in an authentic, play-based way. 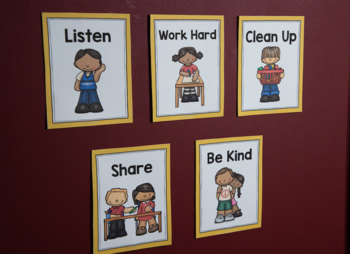 • books and poems to "read aloud"
I have also added suggestions for organizing your dramatic play area in ways that will help students to be independent while using it and during clean-up! 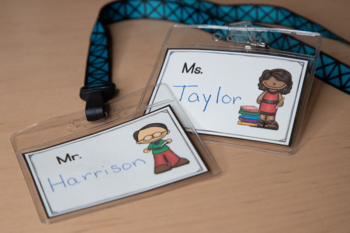 A key part of this organization is shelf labels with words and pictures - indicating where to place the pretend school materials. These tips and shelf labels will help your center run smoothly! 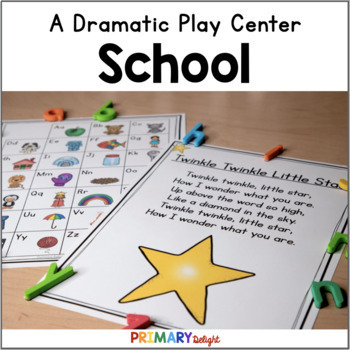 This is part of Dramatic Play Centers Bundle 2 and the Growing Mega-Bundle of Dramatic Play Centers. This kit is part of a series of dramatic play centers that incorporate authentic opportunities for reading, writing and math. Do you want to see more? Look here! Follow me (click the link by the green star by my store name) to be notified when more dramatic play centers are added. All new products are 50% off for 48 hours! Follow me on TPT (by clicking the green star above) or on Facebook to find out when new products are posted!